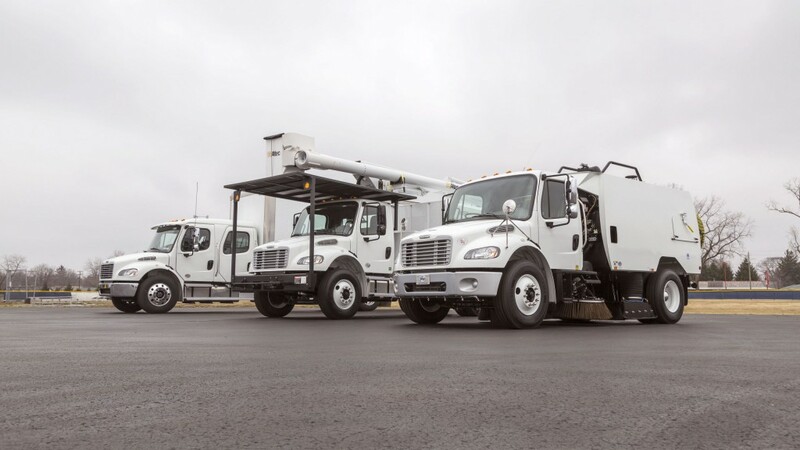 "All of our vocational and medium-duty products are designed for applications requiring reliable products," said Kelly Gedert, director of product marketing for Freightliner and Detroit Components. "Whether we're developing new powertrain technologies or working with bodybuilders to make the upfitting process as efficient as possible, our priority is to provide the right solutions for our customers' applications." • Freightliner 114SD Set-Forward Axle model with a Detroit DD13 engine and Allison 4500 Rugged Duty Series (RDS) automatic transmission. The truck has custom interior options installed by SportChassis, and an Ox Bodies dump. • Freightliner 114SD Set-Back Axle Compressed Natural Gas (CNG) SwapLoader roll-off truck with a 50,000 lbs. dump capacity and 50,000 lbs. lift capacity. The truck has a Cummins ISX12 G engine and Allison 4500 RDS automatic transmission. • Freightliner M2 112 Set-Back Axle CNG model with a Cummins ISL G engine, Allison 3500 RDS automatic transmission, and Elgin body. • Freightliner M2 106 Set-Back Axle model spec'd with a Detroit DD5 engine and Allison 2500 RDS automatic transmission with Power Take-Off (PTO) provision. The truck is upfitted with a Valew closed back fuel and lube system. • Freightliner M2 106 Set-Back Axle bucket truck spec'd with a Cummins B6.7 engine, Allison 3500 RDS automatic transmission with PTO provision and a Posi+ LineRunner cable placer, which has as working height of 40 feet. • Freightliner M2 106 Set-Back Axle truck spec'd with a Cummins B6.7 engine and Allison 3500 RDS automatic transmission with PTO provision. The truck is upfitted with an Altec chip box. • Freightliner M2 106 Set-Back Axle with a Cummins ISB 6.7 engine and Allison 2500 RDS automatic transmission with PTO provision. The dual steer truck has custom interior options installed by SportChassis. In addition to truck models, also on display in the Freightliner booth will be the Detroit DD5, Detroit DD8 and Detroit DD13 engines. The DD8 was unveiled at last year's Work Truck Show and recently started vehicle production, and the DD5 engine - Detroit's first medium-duty offering - is chosen by one-third of customers when there is technical coverage for their application. Detroit engines are built for power and efficiency. Along with ease of maintenance, they have the longest service intervals in their class. Included with the DD5, DD8 and DD13 engines is the Detroit Connect Virtual Technician remote diagnostics service. This feature allows fleet managers to make informed service decisions without compromising uptime.